TRY Online Lessons, Free lessons or Ask Dr Lam. The CDC, health depts and arthritis foundations recommend Tai Chi for Health programs. Tai Chi for Health gains official recognition in Saudi Arabia! 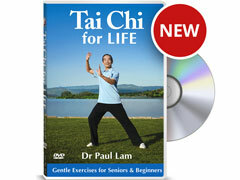 To celebrate the launch of Tai Chi for Life worldwide, receive a 35% discount when you purchase Tai Chi for Life this April. Please use code TCLIFE when ordering. Offer expires end of April, not to be used with any other discount.